Now we have a Star Wars film that is not part of the Star Wars saga. 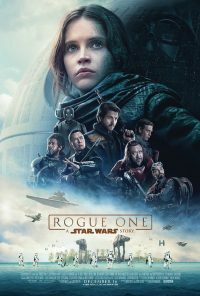 Rogue One is a self-contained story that tells of the events leading up to the ebents of the first Star Wars film. This is the story of Jyn Erso (Felicity Jones) and Cassian Andor (Diego Luna) who steal the plans to the Death Star that eventually end up in the hands of Obi-Wan Kenobi. Along for the ride are a reprogrammed Imperial droid (Alan Tudyk) with a nice line of snark (and who also gets the best line in the film) along with Chirrut Îmwe (Donnie Yen) as a Force wielding monk (not a Jedi) who proved to be a real favourite for all three of the boys. Our core crew is rounded out with Chirrut’s companion, Baze Malbus (Wen Jiang) and pilot Bodhi Rook (Riz Ahmed). It’s a testament to the film that, ny it’s end, I was rooting for each and every one of these characters. The film does sag a little bit in the middle, and suffers from a bit of a CGI induced uncanny valley moment (it’s done well, but you’ll know it when you see it) but the battle that it all builds up to more than makes up for this and provides some genuine edge of the seat moments. Rogue One: A Star Wars Story is not the best science fiction film ever made, and it’s not the best of the Star Wars films. But it’s a damn good film and one that is well worth watching. As a final note, having just rewatched the trailer, it needs to be noted that the special effects and set design are both superb. Not only do they fit, very effectively, with the aesthetic of the original film but they also work to emphasise the sheer scale of the Empire. This may not be an epic story, but it does a great job of underlining the epic nature of the universe it inhabits.